We see chess everywhere and so do Chess Blog readers. Here's a nice theme set post sent to us by reader Elvina Schenko of Berlin. This Batman chess set priced at $795.00 comes with a special feature: A press of the Batman symbol illuminates 50 LED lights encircling the clear playing surface that lights the board, the Gotham cityscape underneath and projects a Bat-Signal to the sky. 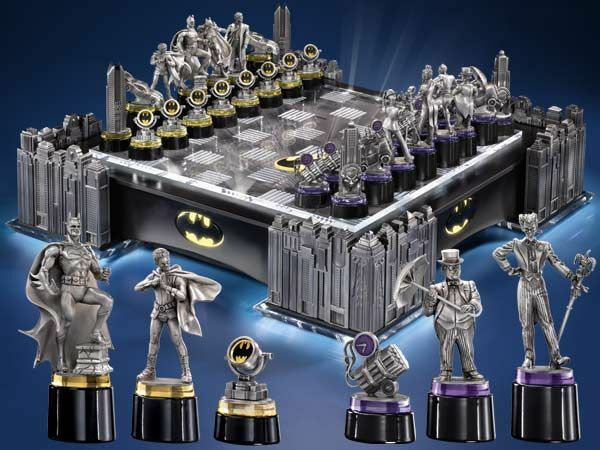 No detail has been overlooked in this ultimate Batman collector's chess set. The joker, Catwoman, Riddler and penguin battle Batman, Robin, Batgirl and commissioner Gordon. The oversized board measures 20 inches in length on each side. Playing pieces measure between 2 1/2 to 5 1/2 inches tall and are made in fine pewter and diecast metal.